In a usual creep test to establish creep curve emphasis is upon strain measurement and stress is consequently chosen such minimum strain rate is attained. The total strain in that type of tests seldom exceeds 0.5 percent and time needed for completion is in the range of 200 to 10,000 hours. The results of that experiments can be directly employed in situations, here creep deformation might be tolerated except then fracture must be prevented. Furthermore, the long time consumed in performing those tests may impede technological enhancement. To cut short such time stress-rupture tests whether specimens fail by rupture have been improved. The basic information such is acquired from the stress-rupture test is the time to reasons failure at a specified nominal stress for a constant temperature. The stress rupture curves are acquired by plotting rupture stress against time of rupture. The strain at rupture could be as high as 50 percent and time needed may not be more than 1000 hours. Concludes of such tests can be directly employed; here creep deformation is tolerated except the fracture is to be prevented. 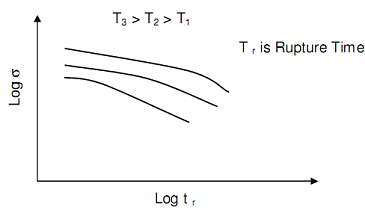 The drawback along with a test is such, at higher temperature several metallurgical changes may take place that change the slope of the straight line or on log-log scale as presented in following figure.